The SparkFun Inventor's Kit for LabVIEW is a great way to add real world connectivity, programming, and hardware incorporation to your LabVIEW projects. The SIK includes everything you need to complete 14 circuit experiments, created in conjunction with the LabVIEW MakerHub, that will teach you how to use the LabVIEW graphical programming environment, read sensors, drive motors, and more. Don't worry, you won't need any previous programming or electronics experience to use this kit. The on-line SparkFun Inventor's Kit for LabVIEW tutorials (in the Documents section below) contain step by step instructions of how to connect each circuit with the included parts. Thorough videos are provided and even includes troubleshooting tips if something goes wrong. 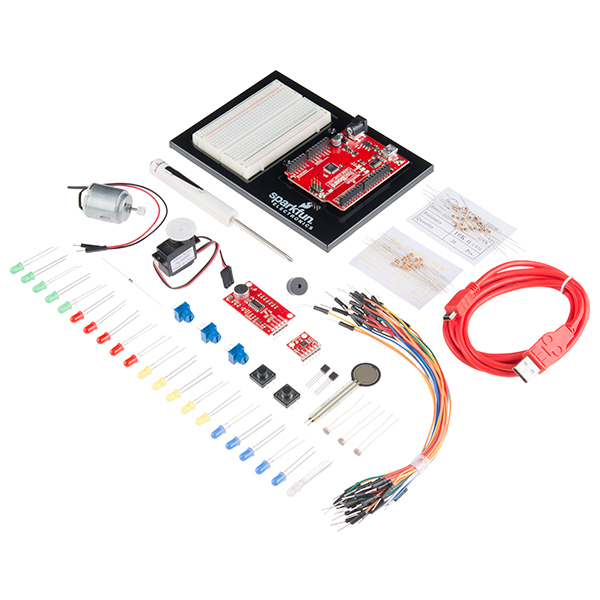 Note: The SparkFun Inventor's Kit for LabVIEW can now ship internationally! You're welcome, world. Could not get the previous edition (Retired SKU DEV-11225) to run under XP or Windows 10... Chances of me shelling out $$$ for the new edition? ZERO. Have been using NI stuff (LW/CVI >18 years and LV > 14 years) for a while. LV is a lock-in to a proprietary and arcane world. You have been warned. As a long-time LabVIEW user I would not use arcane or proprietary to describe it. It is easy to use, easy to read but can be "written" just as poorly as an other language, graphical or not. It is very widely used especially with test and measurement, automated/production testing and automation. It works very well and is equally well supported by NI and through dozens of forums. I just wanted to add to this because it was a balanced reply. Bravo. LabVIEW is what it is. Yes, it's proprietary. Yes, it's VERY different from ANY language and that may seem arcane. However, it grew up in a very specific environment and, as such, is very good in that environment. As stated above, it's widely used in R&D labs, production testing lines, automated tests, and general measurement gathering. Why? Because they do an amazing job of shortcutting tedious driver work and GUI work. They also have done an amazing job of making parallel processing dead simple. Yes, I know you can accomplish all of this in any other language, but in the environments above, time is ABSOLUTE king. Saving schedule and everyone's time more than makes up for the cost of NI products (and they are expensive). So buy this kit as a learning tool and a stepping stone. Now, I know a lot of people have been grinding their teeth up until now. Here's what it is not. LabVIEW is not lightweight. It has overhead you can't control due to code being compiled behind the scenes. LabVIEW is not really for mass released product. It comes with a laundry list of drivers and an entire runtime environment when compiled. LabVIEW is nothing like text languages. In fact, if you keep any of your old programming notions, I absolutely guarantee it will come back to bite you. Take time to do the training and drink the KoolAid. LabVIEW is mostly compiled behind the scenes. Your block diagram gets turned into binary code in a rather complex way. This may scare some people. What did we learn today? A tool is a tool is a tool. Use it for what it's good at and don't get mad when your hammer doesn't drive a screw very well. As such, use this kit to learn LabVIEW if the above fields interest you. Being good (I mean really good) at LabVIEW is a skill we've always looked for in the past two jobs I've been in. Proprietary ... Yes, obviously. Arcane... Yes, "magics" dll's everywhere. As M-Short said this kit includes the LabVIEW Home bundle (LabVIEW Home Edition, the LabVIEW Control Design and Simulation Module and the Mathscript RT module). Each of these pieces of software is identical to the full 'professional' version except that these are licensed for non-commercial use and have a watermark on the front panel and block diagram. No features have been limited from the pro versions. Let us know if you have any more questions about this. It is the new Labview Home Edition. If you want to find out more about it I'd recommend checking out the getting started guide. Follow the directions for the download and just skip the section where you enter the serial number. There is a free trial that lets you play with the software and if you decide to get it you can just add the serial number in once you get it. I'd really like a version of this product that doesn't include a LabVIEW license. I still have my academic license and a license at work, so I don't want to buy a third one. We do sell all the parts in the kit individually as well and the tutorials are all online. Your best bet might just be to grab the individual parts we need. Nice. My brother (who incidentally works for NI) got me the Arduino+Labview bundle (Retired SKU DEV-11225) for Christmas, but I haven't played with it much. I like what I see with the tutorials, so now I just need to check my parts against the components in this SIK and order the missing ones. Does this include a Mac version for 10.10.x ? Unfortunately no, LabVIEW Home Edition is Windows only. What are the component differences between this and the SparkFun Inventor's Kit v3.2 (KIT-12060)? Interesting- this may be the first license I have seen requiring "non-commercial, non-industrial, non-academic purposes". Hi, For some reason the Quickstart Instructions link takes you to an error page. Ah, looks like the link was missing that secure hypertext transfer protocol. Should be fixed now, though! At work, as a Test Engineering Specialist, LabView is king for test automation. Up to now, the SW has just been too expensive (either for my employer to add a license for a 'novice like me' or for me to purchase for myself). This opens the way of growth for me using HW I am very familiar with (Arduino). Since I am a Linux fanatic, I had to purchase a Windows 7 computer just to use this kit; and it took me a whole afternoon to set up the SW; but finally everything was communicating. I have great expectations for this! It really deserves 5 stars; but it is my protest that I have to use Windows and it could of been a little easier to install. Easy to use and just works. I purchased this specifically to learn LabVIEW. I've already done some Arduino programming and this doesn't teach you anything about that but it teaches you a lot about LavVIEW. I wish the schematics were more than just a picture of the assembled circuit, that's the only thing I have been left wishing for. Like the kit, so far the videos have been great as well. One pleasant surprise: my LabVIEW codes from 2001 run fine on LabVIEW 2014 Home version. A great kit for getting up to speed on Arduino with LabVIEW. This kit has a great selection of items to try out, and allow the engineer to get a sample of what to use for future projects. FYI - this kit will NOT teach you LabVIEW. There are other resources much better suited for that.